Multi-Systems Network Display Station (NDS) enables security professionals to efficiently manage the continuous flow of baggage and parcels for inspection while ensuring a thorough threat detection process at the screening site. 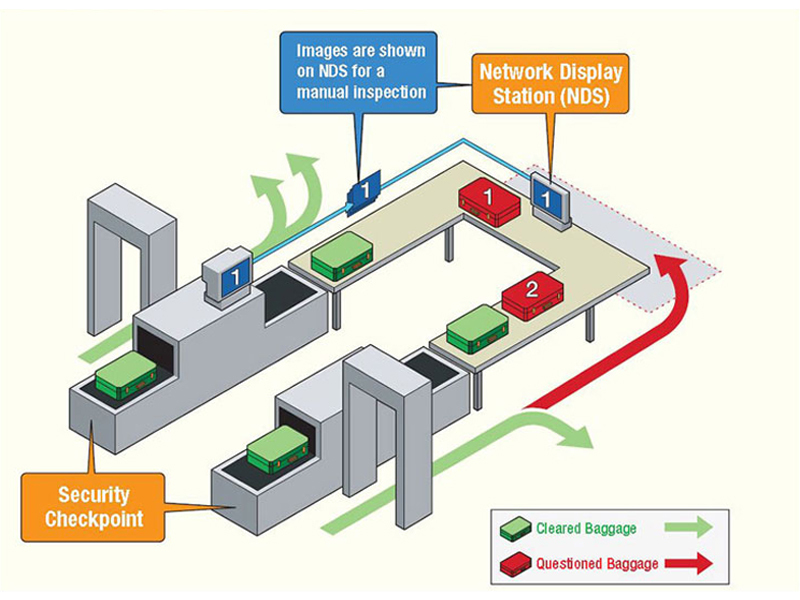 Rapiscan® Systems’ Multi-System Network Display Station (NDS) enables security professionals to more efficiently manage the primary and secondary inspection process, improving the continuous flow of baggage and parcels, while still ensuring a thorough threat detection procedure at the screening site. With the Multi-System NDS, the X-ray image of bag or parcel contents is transmitted with the location of the suspicious objects marked and annotated by the local operator, to the secondary NDS display. The manual search operator can then reconcile the scanned items image with the contents of the actual item. The annotated image allows the secondary operator to quickly recognize the search area in a suspect item. The NDS simplifies and improves the throughput of screening procedures and improves the communication between personnel responsible for different yet related tasks. With the NDS, security operations are able to improve the passenger and customer experience, make interoperability between security personnel more convenient and effective, and facilitate management of labor and staffing expenditures. Comprehensive screening of baggage and parcels in aviation checkpoint, air cargo, customs and other critical infrastructure sites is a requisite in today’s era of security mandates and terrorism risks. At the same time, the management and operations personnel in these environments are constantly struggling to have the most efficient and cost-effective processes in place to minimize negative consequence of the required security screening activities.